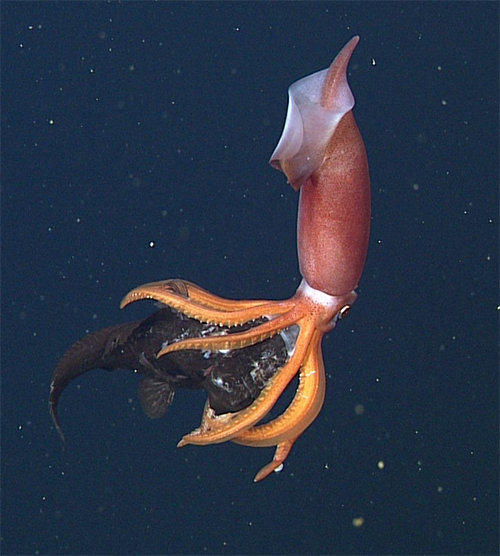 One of the interesting animal behaviors discovered in Monterey Bay, a small black-eyed squid eating its much larger prey, the deep-sea bigscale. This squid is about 10 centimeters (four inches) long, while the fish is about 25 centimeters (10 inches) long. This is why we at MBARI have come to refer to Monterey Bay as being a window to the world. Its unique location adjacent to a deep submarine canyon makes it perfect for developing new systems for studying ocean waters and the underlying seafloor, leading to opportunities for making novel discoveries both locally and far afield. 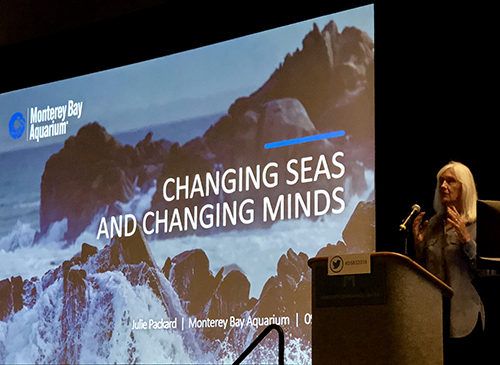 The concentration of institutions surrounding Monterey Bay that touch on some aspect of ocean education, science, engineering, policy, resource management, or conservation naturally brings together experts from many different walks of life and catalyzes interdisciplinary collaboration. As MBARI embarks on its fourth decade of furthering ocean science and technology, what we call “MBARI 4.0,” we face both the excitement of the unanticipated discoveries that lie ahead as well as the realization that the very animals and processes we seek to learn about are undergoing profound changes and may be irrevocably altered before we can even describe them for the first time. Arguably, never before has there been such a moment in the history of ocean science. Bringing this information to light for a broad audience, inclusive of scientists, engineers, policy makers, and the public at large, is one of MBARI’s primary goals, and was a driving force behind Heidi Cullen’s arrival at MBARI this past year. Among many other duties, Cullen now oversees communication of an eclectic mix of topics that span from the sea surface to seafloor, encompassing all disciplines of ocean science and technology, even marine archeology. Disseminating results of our work via interactive digital and social media, traditional print and video outlets, and live presentations, are all aimed at sharing the wonder of what lies beneath the ocean surface as well as highlighting the importance and societal benefits that fundamental marine research and engineering afford.